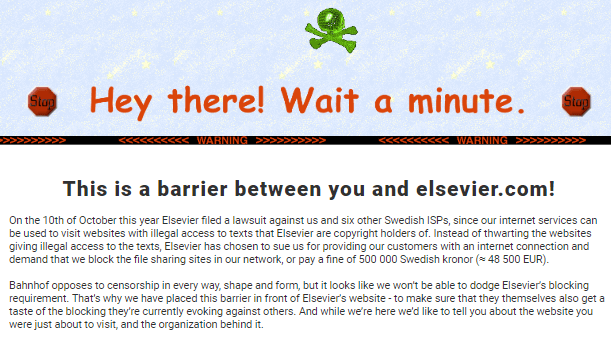 Bahnhof is the Swedish free-speech-oriented ISP that was finally forced to block access to Sci-Hub (a site providing principled access to paywalled scientific literature) retaliated against science publishing giant Elsevier and the Swedish Patent and Market Court by blocking access to their sites for Bahnhof customers, redirecting requests to a page explaining why the block was in place. Now, the Swedish Post and Telecom Authority (PTS) has announced that it will investigate Bahnhof for violating Net Neutrality rules, which require that ISPs do not interfere to block users from accessing sites they want to visit (the rules carve out an exemption for blocks like the one Elsevier secured through the Patent and Market Court). “Bahnhof gets a legal threat to block sites out there somewhere on this huge computer network called the Internet. We block the sites because in reality there is no legal chance to win cases against the copyright mob, since the judge and court are corrupt, and it also comes with a package of astronomic fines,” he explains. Karlung says that the PTS appears most interested in the ‘counter-blocking’ of Elsevier, which he characterizes as a “fine opportunity” to tell people about the dangers of site-blocking which targets “the soul and core” of the Internet.